A 40-year-old Caucasian man with a complaint of floaters in the left eye that started two weeks prior to presentation, at which time he had a seizure secondary to alcohol withdrawal while being evaluated in the emergency department for severe epigastric pain. Following stabilization, he was subsequently found to have profoundly elevated serum lipase of 3450 IU/L, at which time an abdominal CT was performed and the findings of which were consistent with acute pancreatitis. Fluid resuscitation was initiated and he was admitted to the ICU for treatment of acute alcohol-induced necrotizing pancreatitis. The patient presented for ophthalmological evaluation following discharge and reported that the floaters were noted immediately following the seizure and have been constant since. Visual acuity is 20/25 in the right eye and 20/20-2 in the left eye. Intraocular pressure is 14 bilaterally. Anterior segment examination is unremarkable. Posterior segment examination is notable for mild vitreous hemorrhage in the left eye, multiple cotton wool spots within both maculopapillary bundles, as well as numerous splinter hemorrhages along arcade vessels in bilateral posterior poles. OCT showed multiple foci of ganglion cell layer thickening bilaterally, which corresponds to clinically noted cotton wool spots. 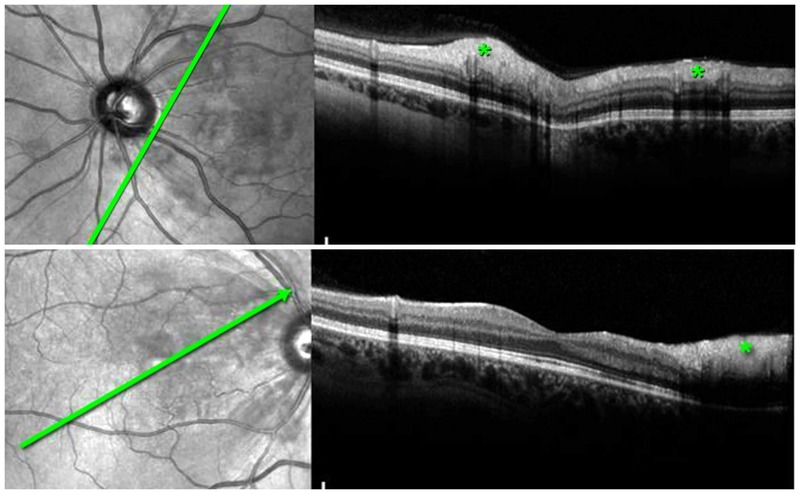 Fluorescein angiography demonstrates capillary non-perfusion corresponding to cotton wool spots noted on clinical exam, multiple foci of blockage consistent with intraretinal hemorrhages, and late perivascular leakage in bilateral posterior poles. 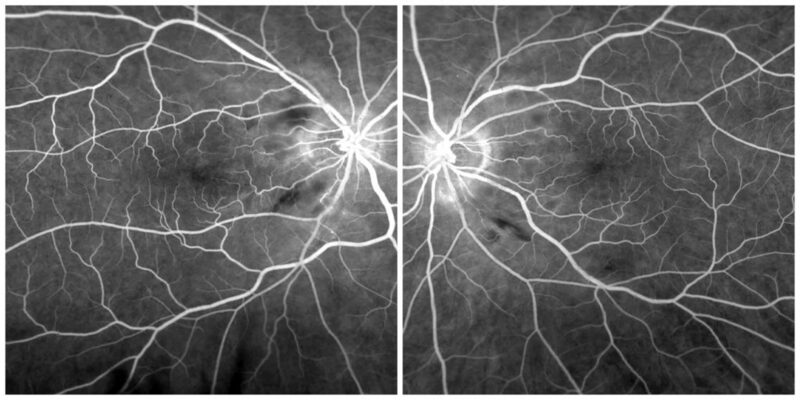 The pathogenesis in Purtscher’s retinopathy is still a matter of debate, but most commonly accepted is that involving leukocyte aggregation and embolization following activation of the complement system, specifically factor C5a.3 This is thought to cause occlusion of small arterioles and capillaries, which causes microinfarctions of the inner retina. Umlas, James W., Thomas R. Hedges, and Kenneth Zbyszewski. “Purtscher’s retinopathy in a patient with acute pancreatitis.” Ophthalmic Surgery, Lasers and Imaging Retina32.3 (2001): 263-264. Miguel, A. I. M., et al. “Systematic review of Purtscher’s and Purtscher-like retinopathies.” Eye27.1 (2013): 1. Carrera, Clayton Rocha Lara, et al. 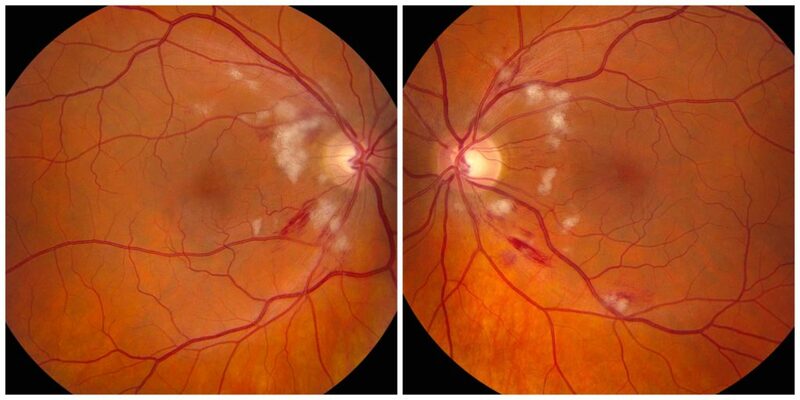 “Purtscher-like retinopathy associated with acute pancreatitis.” Sao Paulo Medical Journal123.6 (2005): 289-291. Ali, Ferhina S., and Ehsan Rahimy. “Bilateral Retinal Whitening in a Hospitalized Patient.” JAMA ophthalmology135.7 (2017): 809-810.